China reported the slowest growth since 1990 on Monday (+6.4%). This an interesting period to reference because, at that point, China was in the latter stages of executing on an economic plan. At the core of that plan was currency manipulation — i.e. devaluing it’s currency (i.e. trashing it) so that they would have a distinct advantage on price when competing for world exports (i.e. they would always be the cheapest). It worked. 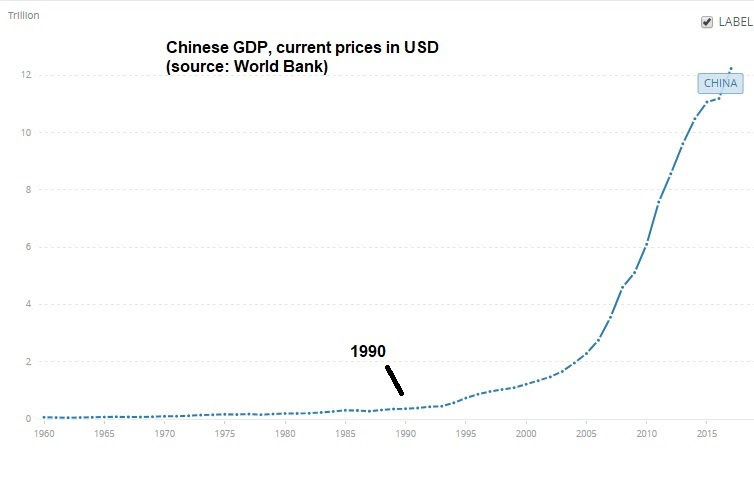 The Chinese economy grew at an average of 12% the following five years (1991-1995). From 1991 to 2009, leading up the global financial crisis, China grew at 10.5% annual rate. That’s 18-years of double-digit annualized growth, on average. That’s why the Chinese economy has ascended from a $350 billion economy to a $12 trillion economy since 1990. Here’s what that looks like in a chart …. Thanks to decades of uncontested currency manipulation, China is now the second largest economy in the world and on pace to be the biggest soon (though it still has just an eighth of the per capita GDP as the U.S.). When they maintain a cheap currency, to undercut the world on price, they become the world’s sellers to everyone. That means they accumulate a mountain of foreign currency as a result (which they have). China is the holder of the largestsforeign currency reserves in the world, at more than $3 trillion dollars (mostly U.S. dollars). What do they do with those dollars? They buy our Treasuries, which keeps our rates low, so that U.S. consumers can borrow cheap and buy more of their goods — adding to China’s mountain of currency reserves, adding to their wealth and depleting the U.S. of wealth. And so the cycle goes. This has proven to be a recipe for booms and busts (big busts), and a destructive global wealth transfer. So coming out of a decade long global economic slog, U.S. growth (driven by fiscal stimulus) has put us in a position of strength to negotiate reform in China.